Looking for a Dianella Window Cleaner you can trust? Need a Dianella window cleaning service? Our local Window Cleaners in Dianella can transform the look of your home dramatically! Dianella, bordering Morley and Mirrabooka is one of the more-preferred residential destinations in Perth’s northern suburbs in Western Australia, with lots of open spaces, tree lined streets and small parklands. A large percentage of residential properties in Dianella are 2 storey homes with views of the beautiful and well-maintained gardens, streets and pathways. Hiring professional services in Dianella can help keep your windows, frames and flyscreen’s spotlessly clean. Professional window cleaners in Dianella use a variety of cleaning tools and techniques to keep your windows clean, depending on the size and type of windows adorning your walls. They have the experience to work at all residential heights using safe and secure cleaning accessories to make sure that there are no mishaps during the process. The best local window cleaners in Dianella use state-of-the-art technology, designed to make sure your windows appear as good as new after they have completed their job. They know exactly how to tackle layers of dirt and grime that accumulate on the window panes and frames. Besides using safe, tested and proven techniques, they also make sure that the detergents and chemicals they use have as little impact on the environment as possible and are classed as non-hazardous substances. Professionals should be able to provide a detailed list of chemicals and hazards. Two storey homes are best tackled by the experts in the industry with expertise in large domestic houses and the right levels of insurance. To assure a safe and effective clean we employ specialised tools and safety techniques that ensure the safety of your home as well as to you and our workers. Our technicians are experienced in two and three storey homes and multi-level residential apartments. You can request an assessment whether it be for a regular monthly clean or annual maintenance. We offer the entire range of services associated with window cleans including internal and external window washing, stain removal, water spot removal, and other blemishes from window panes, frames and fly screens. We will also make sure that cobwebs are removed and the windows and surroundings look spotlessly clean and sparkling. We also clean signs, frames, pool glass, mirrors, glass table tops, facades, solar panels, and even walls. If you want your windows looking new and spotless, use the services of our leading glass technicians in Dianella. There are many companies offering cleaning services but not all of them are equipped with the right tools, technologies and experience to deliver great results. 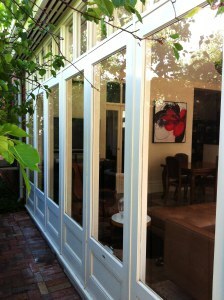 Choosing carefully will give you good value for money and, of course, great looking windows. Feel free to contact CCC Window Cleaning for a free quote! 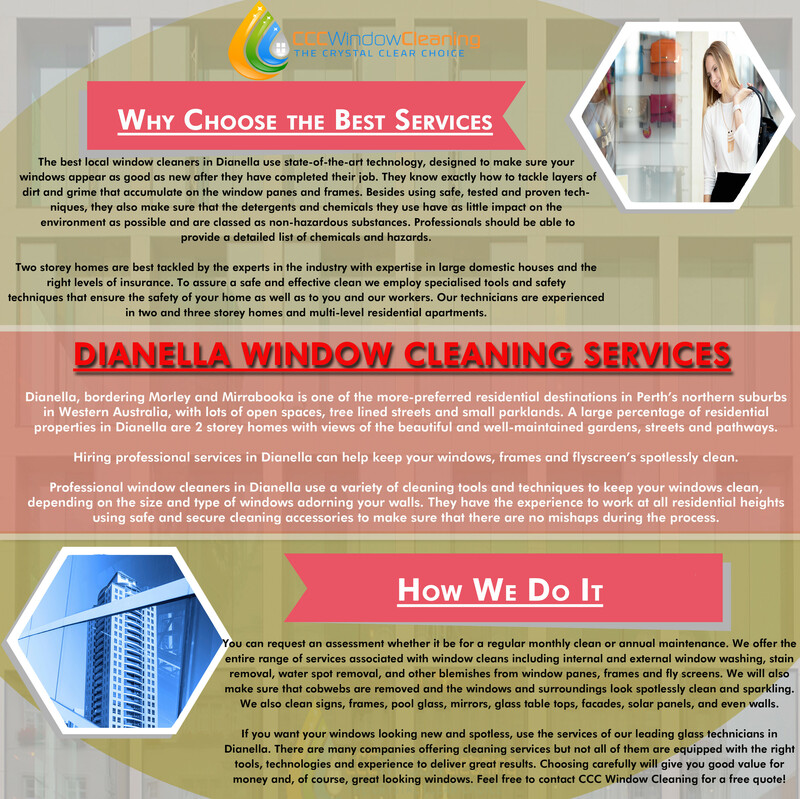 Dianella Window cleaning is one of the tasks that is taken for granted by numerous people. Unknown to many people, a clean window greatly influences your surroundings. If you let dust accumulate on your windows, they will influence the temperament and colour of your home. The beauty of your company is highly dependent on how clean your offices windows are. When clients come to visit, they notice the small details at time subconsciously, which in turn affects how they are going to make decisions. Offices that have dirty windows can be a great turn off to clients. Clean windows make the office vivacious and lively. Windows can contribute greatly in creation or breaking an image. The windows speak tons about your organization and can be an advantage or a disinvite considering their cleanliness. Dusty windows show lack of commitment and desire to achieve greatness. Impressions are formed based on the atmosphere of the office which is greatly influenced by the natural light getting into the office. Your employees will be more natural if they work in an office that is bright and vibrant, they will be better organized and vibrant. Glass is permeable and collects dirt that over the time make fragile or cause loss of transparency. Once dirt has accumulated it can cause pigmented spots which encourage growth of microorganism. At the end of the day these microorganisms might end up ruining your glass and require you to replace them. There are many elements that require you to clean your glass frequently. These are inclusive of hard minerals which may source from sprinkler system; rust this is caused by windows being encased in metal frames and screens; acid rain, sea spray that leads to the accumulation on the surface of your glass and over-spray accidental paint, chalk and mortar particles. Dirty windows affect the overall heat efficiency of your home. Dirty particles on the surface and in the pore of the glass replicate more UV light, preventing the sun from warming up your apartment during cold seasons. Dirty windows may cause an increase in heating expenses. It is cost effective to frequently clean your windows than wait for dirt to accumulate first. Once your windows start showing the marks of time, it might be next to impossible to reverse the process. Small cracks, mould and scratches will gradually destroy the glass and have you replace the entire window. When thinking about how often you should clean your windows, consider the frequency of rain in your area. It is also important to gauge the pollutants, both natural and man-made, in your area. Observation of how first your windows attract dust is important. It is important to know that different cleaning solutions have different effects on the window. If the area you live in is highly populated it is important to clean your windows every once in a week. You can get your windows cleaned using the following simple procedure. First and foremost, wash with a strip applicator. Secondly, wipe clean with a sponge and dry off remaining drips. After this is done scrub the panes and wipe them. If there are any stubborn stains that are still visible, try getting rid of them by rubbing on the spot. To clean your window like a professional, there are a number of tools that are a must have. These tools are inclusive of: a strip applicator, a sponge or wet cloth and detergent. Though this is not a task that people look forward to, it is a vital element that reflects our commitment and can speak tons about our character.